Water-deficit stress is detrimental for rice growth, development, and yield. Transcriptome analysis of 1-week-old rice (Oryza sativa L. var. IR64) seedling under water-deficit stress condition using Affymetrix 57 K GeneChip® has revealed 1,563 and 1,746 genes to be up- and downregulated, respectively. In an effort to amalgamate data across laboratories, we identified 5,611 differentially expressing genes under varying extrinsic water-deficit stress conditions in six vegetative and one reproductive stage of development in rice. Transcription factors (TFs) involved in ABA-dependent and ABA-independent pathways have been found to be upregulated during water-deficit stress. Members of zinc-finger TFs namely, C2H2, C2C2, C3H, LIM, PHD, WRKY, ZF-HD, and ZIM, along with TF families like GeBP, jumonji, MBF1 and ULT express differentially under water-deficit conditions. NAC (NAM, ATAF and CUC) TF family emerges to be a potential key regulator of multiple abiotic stresses. Among the 12 TF genes that are co-upregulated under water-deficit, salt and cold stress conditions, five belong to the NAC TF family. 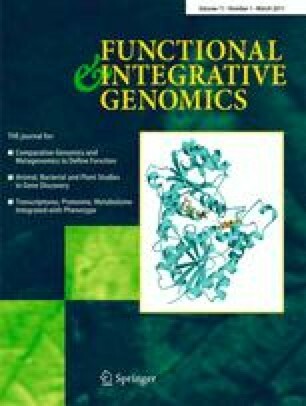 We identified water-deficit stress-responsive genes encoding key enzymes involved in biosynthesis of osmoprotectants like polyols and sugars; amino acid and quaternary ammonium compounds; cell wall loosening and structural components; cholesterol and very long chain fatty acid; cytokinin and secondary metabolites. Comparison of genes responsive to water-deficit stress conditions with genes preferentially expressed during panicle and seed development revealed a significant overlap of transcriptome alteration and pathways. The online version of this article (doi: 10.1007/s10142-010-0187-y) contains supplementary material, which is available to authorized users. This work is supported by the Department of Biotechnology, Government of India, the Council of Scientific and Industrial Research (research fellowship to P.D. ), and the University Grants Commission (research fellowship to P.K.D. ).